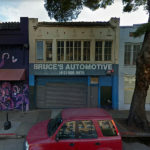 The number of people living in San Francisco with a job ticked up by 2,000 in December to a record 572,800, roughly matching the December increase in the labor force (1,900) which held the unemployment rate in the city, which hit a record low of 2.1 percent this past April, at 2.2 percent. And as such, there are now 136,100 more people living in San Francisco with paychecks than there were at the start of 2010 and 15,000 more than at the end of 2017. In Alameda County, which includes the City of Oakland, the estimated number of people living in the county with a paycheck ticked up by 1,100 in December to a record 846,300, which is 153,500 more than at the start of 2010 and 21,300 more than at the end of 2017, while the unemployment rate held at 2.8 percent. 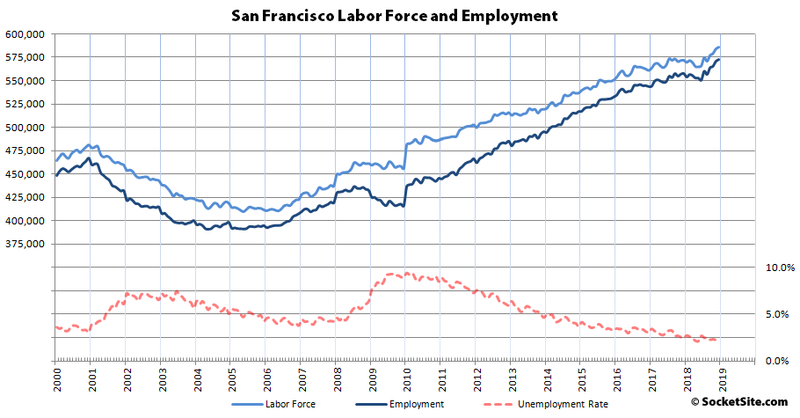 Across the greater East Bay, total employment inched up by 1,500 in December to 1,407,900, which is 35,700 above its mark at the end of 2017, while the unemployment rate inched up from 2.8 to 2.9 percent. Up in Marin, the number of employed residents inched up by 400 to 142,800, which is 5,100 more than at the end of 2017, while the unemployment inched up from 2.2 to 2.3 percent. 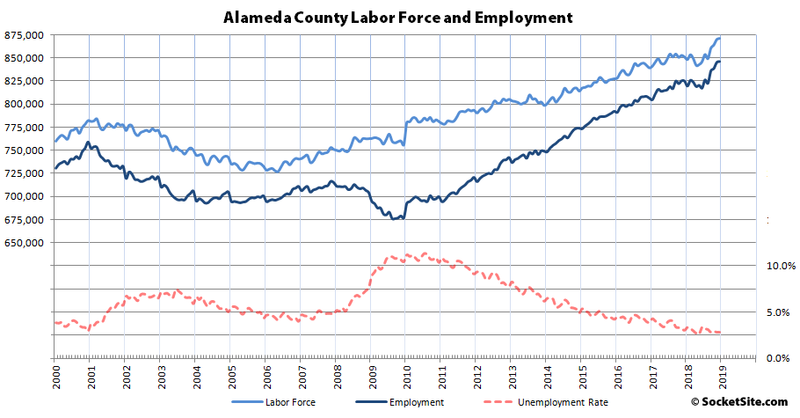 And down in the valley, employment in San Mateo County ticked up by 1,500 in December to a record 456,700, which is 12,300 above its mark at the same time last year, and the unemployment rate helod at 2.0 percent, while employment in Santa Clara County increased by 2,200 to a record 1,058,800, which is 38,100 more than at the end of 2017, and the unemployment rate held at 2.4 percent, resulting in a blended unemployment rate of 2.3 percent across Silicon Valley and 2.5 percent across the greater Bay Area. All that being said, keep in mind that Bay Area home sales actually declined last year. And in San Francisco, pending sales and their associated prices are down, while inventory levels are up. (c) A simple, effective – and patriotic !! (‘cuz it uses Red, White and Blue) – graph. Well, who couldn’t see that coming? The way venture capital works is that most startups fail, but a tiny fraction of them succeed wildly enough to pay for all the failures and then some. That sounds like “this time is different” but it’s been working across many business cycles now. Because of this, filling the comments section with dead or dying startups is boring. You must know that even in aggregate they are meaningless compared to the top three IPOs scheduled this year. IMO you would be better off fixating your bearishness on a recession in the next six months that shuts down the IPO market. ..and if you’ve been paying attention, you would know that uber and lyft will launch fall below their current valuations, because neither company has a viable model to ever turn a profit. Nobody is saying relying on IPOs for a healthy economy, or uses stock prices to talk about company’s health except for like four bears on this website. Netflix is in trouble, or something? no, it isn’t. They just raised their subscription prices and popularity is soaring. Who do you think you’re trying to fool with those sort of takes? so weird. IPO nowadays is a way to cash out not cash in, and you are correct, it’s a race against time with the next recession for the likes of Uber and Pinterest etc. You are also correct about VCs funding a thousand lame startups to get one Facebook, and this an artifact of artificially cheap Fed money, and a great justification for believing we are in a bubble right now. I remember the avalanche of pink slips 2001 like it was yesterday. Today’s tech economy is completely different than 2001’s. But our president is doing everything he can to drive the economy off a cliff, and it’s looking like he will succeed. The VC model is not an artifact of the recent low interest rates. Apple took VC funding in 1977. But I’m glad you understand the model so well and we won’t have to endure a comment every time some penny ante delivery startup goes bust, or every time a WSJ article features a story about a company named “Hustle” that seems to specialize in bullshitting people and is falling on hard times, because we both know that doesn’t have anything to do with where the real money is. Anyone remember F’ed company in the 2000 bust? Someone should bring that back. We’re gonna need it. Like clockwork, the “hey what about this company it is indicative of everything” comment. You say Munchery I say Juul. Whatever. Didn’t you read his article “Rout of publicly traded tech firms fosters newfound restraint for investors in younger startups”? It’s all across tech from big publics to seed rounds. I did read that article, with its cursory look at a few companies, general pessimistic takes, reference to all time high 2018 VC investiture, recent Nasdaq peaks, etc. And we will see what transpires. Although we’re getting a bit sidetracked from Real Estate discussion – tho this particular thread is (presumably) more about people working than where they work – this points out one of the primary issues for those concerned about Tech 2.0 (whether/not it’s a precise replay of 1.0): the often dubious valuations of many of these firms. In principal valuation is straightforward: you come up w/ a cash flow projection, then discount it by a healthy rate to recognize that most of these snowflakes are going to melt; this latter step -adjusting for risk – seems to have become optional to many people, so we have 100% of people claiming they’re going to be the 1% who make it…and – to go full circle back into R/E – they’re often renting from people, and at rates, that seem to think the same thing.